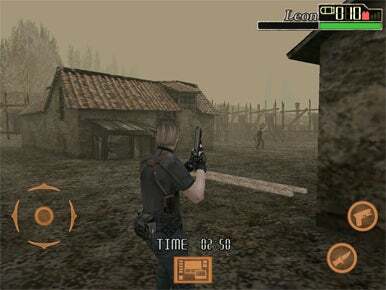 Resident Evil 4 iPad Edition brings the celebrated horror title—already available for the GameCube, Play Station 2, Wii, and iPhone—to Apple’s coveted tablet. Fans of the Resident Evil series will no doubt appreciate the game’s graphically satisfying HD transition to the iPad, but newcomers and old-hands alike will bemoan the game’s overly-limited controls. By the end, you'll wish this was a ghost town. Resident Evil 4 casts you as Leon S. Kennedy, a US agent tasked with rescuing the president’s kidnapped daughter. Along the way, you’ll encounter seemingly endless hoardes of zombies and other unpleasant individuals who just want to kill you. "Unfortunately, the interface is still clumsy thanks to a mechanic that requires you to hit the action buttons to enter and exit shooting/stabbing/walking modes. Even after a few hours, the controls still don’t seem natural." You’d assume that Capcom would address these common complaints about the iPhone version’s controls when bringing Reisdent Evil 4 to the iPad. But you’d be (un)dead wrong. Because you can’t fire your gun or use your knife while moving, you’re constantly forced to toggle between those modes. Since it takes a moment to make the switch, you too-often must leave yourself vulnerable to your attacking enemies if you decide to adjust your position after brandishing your weapon. It’s lousy. Just as frustrating is the game’s modal dialog every time you collect booty from someone you’ve gunned down. First, you must walk to precisely the right spot so that the “pick up” action button appears. Then, when you pick up the item itself (like replacement ammunition), that dialog appears telling you precisely what you just picked up. But then you need to tap a checkmark to continue. That’s a lot of tapping to pick stuff up, and it’s needlessly time consuming—particularly when you’re being hounded by folks intent on killng you. Also disappointing is the fact that you can’t adjust the camera view by swiping the screen. With a surface area as large as the iPad’s, it’s a gesture that feels natural, but has no effect. Less unfortunate, but still annoying, are the grammar mistakes that characterize the game’s on-screen text during cut scenes. I must also note that each time you launch Resident Evil 4, the game opens with a video. You can tap to skip the video and go to the game’s start screen, but I must once again use this Macworld real estate to remind game developers that—no matter how strong the production values—gamers don’t want to be forced to skip your introductory video every time they launch the game. Now, Resident Evil 4 is still playable in spite of these weaknesses. As I referenced at the outset, the game looks truly impressive on the iPad. Textures are complex, and the framerate seems excellent. The soundtrack sets a nice mood (though some sound effects get a bit repetitive). Exploring different towns, killing endless attackers, and of course perserving your own life all provide plenty of thrilling, violent fun. In addition to “Story Mode,” the game also sports “Mercenary Mode,” which presents unlockable, quick challenges—like seeing how many kills you can score in 3 minutes. If you’re able to look past my gameplay grievances, Resident Evil 4 offers hours of gaming. You’ll just need to be incredibly patient in the face of some very poorly-implemented controls.